When are Town Board Meetings? Every second Tuesday of the month at 7:00 pm at the Town of Wyoming town hall. I just moved here. How do I get rid of my garbage? The town garbage and recycling center is open to all Town of Wyoming residents every Saturday from 8 a.m. until 2 p.m. Bundle your paper. Plastic, aluminum cans and glass can be together. When does the Planning and Zoning committee meet? They meet on the first Tuesday of the month on an as needed basis. Check the agenda tab to see if one is planned. What is the Working Lands Initiative? What is a property owners responsibilty for payment of property tax? 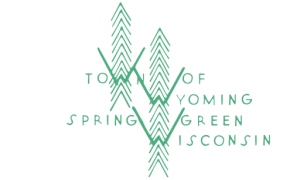 OPTION ONE: PAY IN FULL to the Town of Wyoming treasurer by January 31st. OPTION TWO: Pay the 1st installment to the Town of Wyoming treasurer by January 31st and the second installment to the Iowa County Treasurer by July 31st. Postponed taxes can be paid to the County Treasurer any time after January 31st but the last date for payment is July 31st. Iowa County has until February 20th to settle with all 29 municipalities for their collections, therefore they cannot issue a county tax receipt until after February 20th.